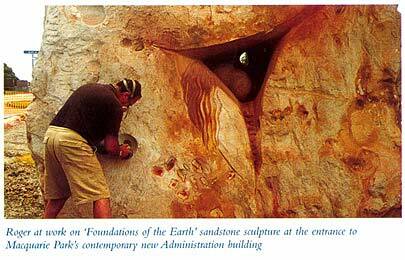 This sandstone sculpture, 'Foundations of the Earth' is aptly named not only because of its concept but also its size. At 4.5m high and weighing 19 tonnes, this work sits upon 7 tonnes of concrete footing. The stone was craned into position and worked on site. 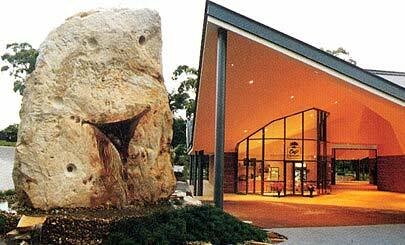 I designed this work as part of a landscape sculpture. Sitting atop an earth mound, this large sandstone piece is the wellspring for waters that issue from the rock, flowing down twin cascades into two ponds. The size of this work is a strong visual anchor for the volume of the 'port cochere' and its mass generates a comforting presence of 'mother earth'. Greeting clients and staff, this sculpture brings the relaxing sound of water into their workplace.